Inside: Wondering whether Life of Fred math is a good fit for your family? Life of Fred reviews can run the gamut from enthusiastic to disparaging. This Life of Fred math review (elementary) will give you everything you need to decide for yourself, because it’s NOT for everyone. If you’ve ever searched for Life of Fred math reviews, you know that extreme opinions abound, and those opinions are all over the map. 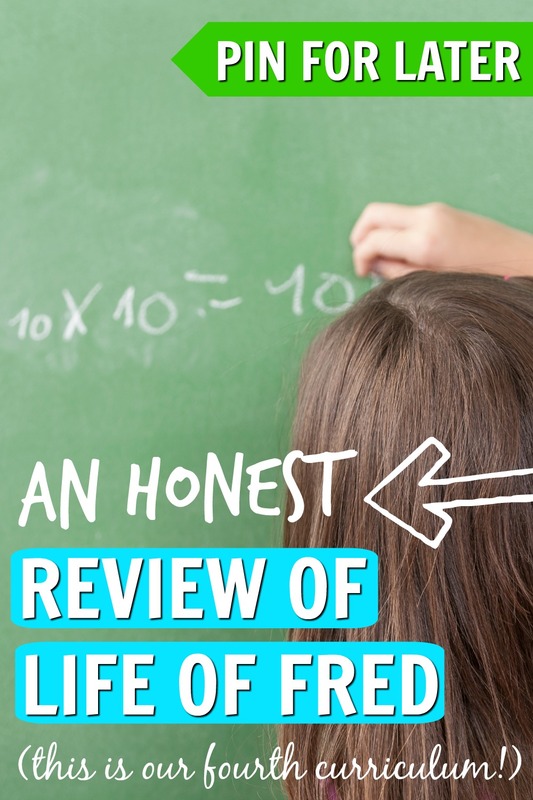 The reason reviews vary so widely is simple: Life of Fred isn’t the right math curriculum for everyone. So how can you know if Life of Fred math is right for your family? Life of Fred is our fourth math curriculum in three years of homeschooling, and I feel like I hit the homeschool jackpot. I only wish I had found it sooner! We started with Singapore Math. This wasn’t my choice; the university model school I sent my daughter to during my first year homeschooling chose this curriculum. Singapore math wasn’t horrible, but it did leave me with the feeling that I could not help my daughter with math. When you love math and are good at math, you shouldn’t need to reteach yourself how to do addition the “right way” for first grade math. First grade math isn’t rocket science: it’s basic addition and subtraction. First grade math should be easy for any parent to come alongside their child and teach the basics. In my opinion, any math curriculum that makes basic addition and subtraction so complicated that a parent is afraid of teaching it wrong? That math curriculum needs to go! ASAP. The year I started with Sonlight, I automatically chose Saxon Math. Compared to Singapore, Saxon felt straight-forward and familiar. I grew up with Saxon and had fond memories of doing worksheets filled with cut and dry math problems. And that pretty much sums up Saxon Math: cut and dry (with a heavy emphasis on the “dry”). After a couple of weeks of trying to teach math using Saxon, I tossed that, too. Did my daughter enjoy the worksheets? A little bit. Was it worth being bored out of our minds? Absolutely not. After Saxon, I tried Math-U-See. Math-U-See was a little bit of a better fit. Instead of Saxon’s one hundred and thirty lessons in a single year, there were only about thirty lessons in a Math-U-See level. I loved that Math-U-See levels focus on a single, overarching concept in each book (addition/subtraction, multiple digit addition and subtraction, multiplication, division, etc.). I want them to see the value of math in everyday life for the average person. I want them to see math as fun. That’s how we landed on Life of Fred Math. Read enough Life of Fred reviews to be convinced Life of Fred is for you? Get the 10-book Elementary set HERE. Life of Fred Math chronicles the adventures of Fred, a five-year-old math professor at Kittens University. That first sentence should prepare you for how absolutely ridiculous the story of Fred is (some parents just can’t get into it). The Life of Fred Elementary Math series includes ten books, in which the author covers all of elementary math. 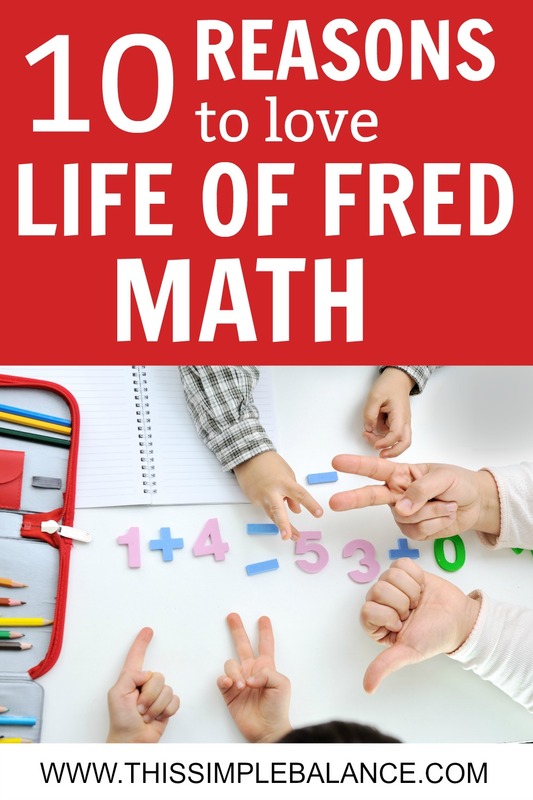 He states that Life of Fred contains “more math than any other homeschool math curriculum.” The author is a math professor who saw a need for a different kind of math curriculum in the homeschool community. Each book is divided into 15-20 short chapters. At the end of each chapter is a “Your Turn to Play” section, which includes five questions for your child to practice the concepts introduced in the current chapter and in previous chapters. 1) You are comfortable teaching most elementary math concepts. If math was one of your favorite subjects when you were in school and are comfortable teaching (or relearning) elementary math, Life of Fred will likely be a good fit for you. 2) You don’t love drill and kill math programs. If you are a big believer in worksheets and doing the same types of problems over and over again for mastery, Life of Fred is NOT the right math curriculum for you. Life of Fred relies on addressing the same concepts over and over again throughout the text. Those concepts build on each other, and the repetition helps students work towards mastery. That being said, we regularly supplement with doing math problems for fun on our whiteboard, doing the occasional worksheet, giving each other verbal math quizzes, and teaching math in everyday life. 3) You are comfortable supplementing with additional math problems in everyday life and otherwise. I am a firm believer that math is everywhere, and real life provides more than enough math teaching moments – more than I can count. If that statement makes you wonder what you’re missing (teach math every day, all the time, what?? ), then Life of Fred may not be a good fit for you. 4) You want your kids to know that math is useful and valuable. Life of Fred shows kids that math is everywhere, that you both use math in everyday life and that you need math. We work hard to point out math in our everyday life as much as possible, and Fred reinforces that. 5) You want your kids to love math and approach math with confidence. As I mentioned earlier, one of my main goals for math in our homeschool is that my kids love math. They beg to read Life of Fred, and they know that Life of Fred is math. I love that they love it and want to do math first. 6) You love subject overlap and integration. Life of Fred brings up multiple different subjects throughout the book. In the most recent two chapters, for example, we learned about homonyms and prepositions. The kids had fun trying to come up with different homonyms and experimenting with various prepositional phrases. In another book, we learned about how libraries organize books alphabetically, and we practiced alphabetizing. This is one of my favorite aspects of Fred – the ability to teach different subjects together. A little math with our poetry teatime (math really IS everywhere). I just taught my daughter how to subtract fractions (a basic understanding of groups and parts of a whole is all you need). The language you use about math is critical – your language and their language. We finished doing the problem from the poem, and Lily replied, "Wow, that's HARD!" I almost agreed, but quickly changed what I was going to say. Instead, I said, "Actually, it just took a long time to do this problem. There were a lot of steps but its not hard once you know the steps." Words matter and dramatically affect performance. Use them wisely. 7) You have a multi-age homeschool. I read Life of Fred aloud to my 8-year-old, my 6-year-old, and my 4-year-old. My 8-year-old already knows some of the material we’ve covered this year, but she still loves Fred. In fact, she begs to read Fred first! At the end of each chapter, I divide up the questions between them. Sometimes, I add questions of varying difficulties so that each child feels both confident and challenged. 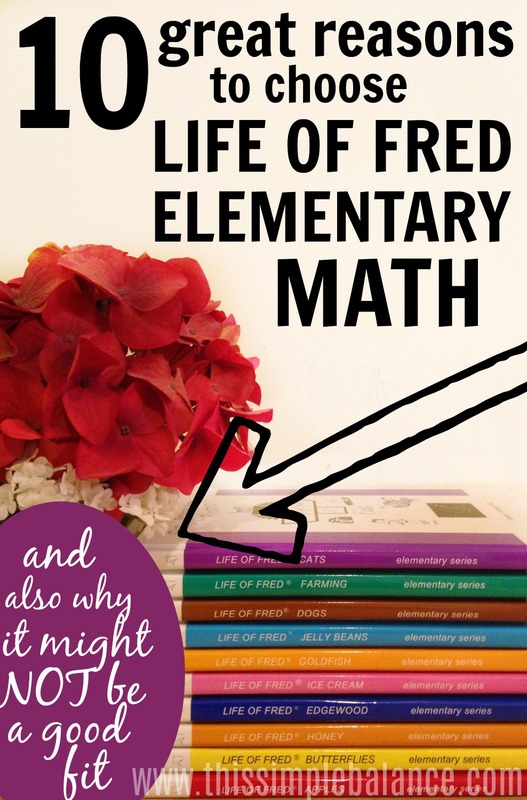 Life of Fred is the perfect math curriculum for a multi-age homeschool, in my opinion. Eventually, I may work back through the series with my 4-year-old and 2 year-old in a few years. I do supplement with my oldest as needed. Related Resource: We have also used Bedtime Math in the past to add fun math to our homeschool day! 8) You’re cool with an absolutely ridiculous story. I should note that at times, you as a parent will feel like Life of Fred is the stupidest story you have ever read. It is completely unrealistic – a five-year-old teaching math at a University?! A five-year-old who barely eats and hasn’t grown past three feet? Seriously?! But that’s the beauty of Fred. It’s so ridiculous that kids love it. They laugh out loud at pretty much every chapter. What other math curriculum can you say that about? 9) You have time to read Life of Fred aloud with your kids. I’m not sure that I would be able to heartily recommend Life of Fred math to homeschool moms who need their children to do the majority of their work independently. I suppose a second grader or third grader could read the story to themselves, but I doubt they would get as much out of it or fully grasp everything. I stop occasionally to explain a concept or point out something to the kids that they may have missed on their own. I can only fully endorse Life of Fred math (at least the elementary math series) as a good math curriculum for moms who are doing school with their kids. 10) You don’t hate Life of Fred. Ultimately, if you hate Life of Fred, it doesn’t matter if your kids love it. Homeschool curriculum needs to work for both the parent and the kids. Me? I’ve fallen in love with Fred, and I love what these books are doing for my kids. 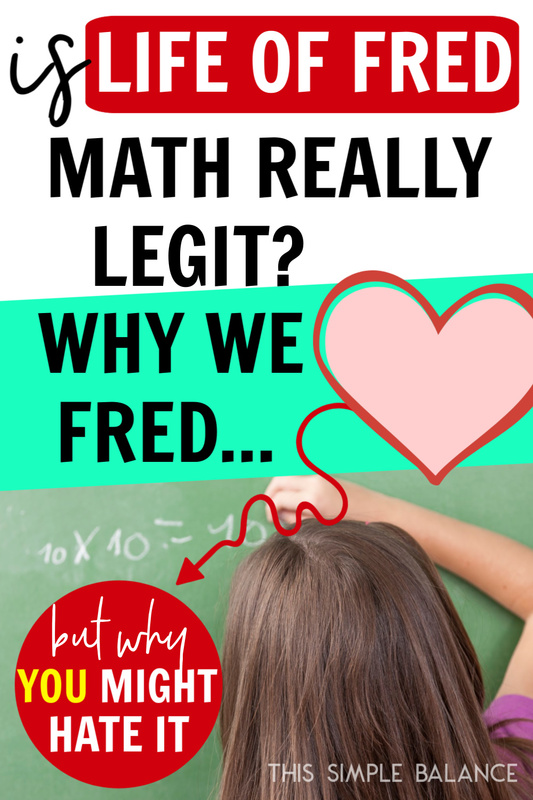 No matter what my kids end up doing in the future, I know that because of Life of Fred, they will love math. The easiest way to buy Life of Fred Math books is on Amazon. You can find them HERE. Still not sure if it will be a good fit for your family? You can purchase the books individually for around the same price. Try one, and see what you think. Start with Life of Fred Elementary Math: Apples. Come back and leave a comment if you end up loving Life of Fred Math, too! Hey, June! Thanks for this review. I’m looking for something to better fit our homeschool as you know, and I have a question. If you have a 4th grader, 2nd grader, and kindergarten, how would that look? Would I start with the first book with all of them? Thanks so much for this review! I have been hearing about Life of Fred for years but didn’t know what all the fuss is about. This definitely sounds like it’s up my alley, and we might try it next year.